Your help is needed. I have a big favor I'd like to ask of ANYONE that visits this site and has a little time on their hands: our friend and former co-worker Scott McMahon, son of our former co-worker Kevin "Crazy Legs" McMahon, has written a book. A book on how to make a film and SELL IT ONLINE. And during this very critical "launch window," he needs Amazon reviews. Why exactly? A bunch of reviews early on in a book's life-cycle gets the notice of Amazon's search ranking, and can help get the tome in question to the top of the relevant search requests. Which is good. Critical, even. But I've been learning a lot reading Scott's book and listening to some of his great interviews on his podcast; fer instance, HERE where he talks to a woman who works as a social media marketer for indie filmmakers, or HERE where he talks with the Oren Peli, maker of "Paranormal Activity", or HERE where he talks to a filmmaking couple who developed their own popular & award-winning podcast called "Film Courage" (HINT: they find YouTube gives them MUCH greater exposure than mere podcasting). So his book and website and podcast offer a lot of useful content. Definitely worth a look. 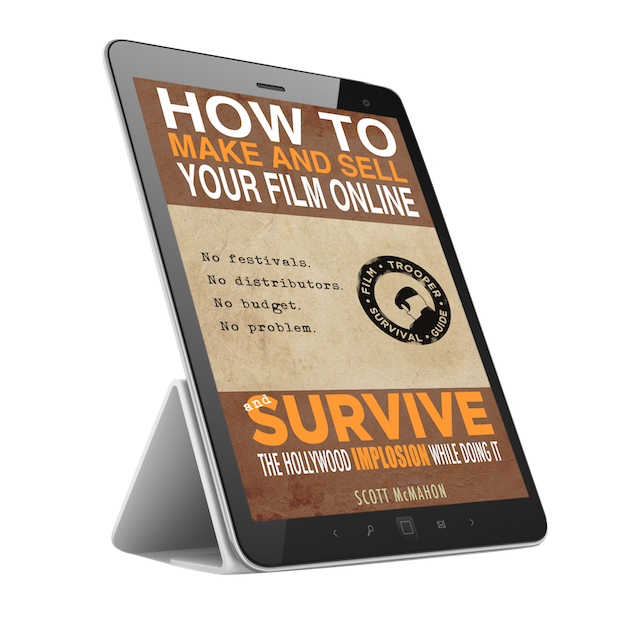 The book is called "How to Make and Sell Your Film ONLINE--and Survive the Hollywood IMPLOSION While Doing It." Seems I recall a person or two on this site mentioning the desire to make a movie...? Scott is hoping to hit 25 reviews for his new book by May 25th....he's halfway there as of today. 12 so far. And MORE than 25 would be great, too! Remember this ... your film (OR COMIC OR DRAWING) product is part of the larger equation. If our goal is to build a product worth $100 to sell to our 1,000 ideal fans, then how do we make our film product worth a $100? You don’t. Your film is the catalyst, the advertisement for something bigger that is worth more than the $0.99 rental price of a single film product. What is this “something bigger"? The whole purpose of carefully analyzing and assessing whom your ideal fan might be ... and learning to listen to their fears and desires ... is to creatively figure out a way to either solve their problem, or spark their imagination. Either way, the key ingredient is to provide your audience great VALUE. Everyday, you should be asking yourself, “How can I provide greater value to my fans?” It’s about them ... not you. Use your talents to serve them a delicious dish of VALUE. What Can You Create That Is Worth $100 Every Year? revenue from this $100 product. If built correctly, you will provide great value to your ideal fan. If you listened well, and built your product(s) with quality, you should be able to sell that $100 product to your fans with ease. Click on this link and download the FREE PDF (and/or Kindle or audiobook, as you please). I will mention for those of a particularly supportive and charitable bent that the book is available NOW on Amazon FOR PURCHASE--it's available as either an eBook or audio book, and when you DO write your review, it will show up as a confirmed purchase, which must be to the good (you can see my review on the website HERE). His website is quite informative with lots of free content (gear lists for the aspiring filmmakers among us *cough* Ellis *cough*). Very interesting to peruse for those of us trying to build out our own sites. 25 reviews by the 25th. We can all help stick it to "The Man" (a.k.a. "Scamazon"). You DON'T need to give the book 5 stars--or any stars. It's the review itself that helps--be honest in your assessment. And remember--you'll be helping a brother-in-arms! I've downloaded content, including the book. I also found your review helpful on Amazon. I'm tempted to download the audio book. That may be the way to go for the first read. Hey. Film Courage is one of my Youtube subscriprions. I've downloaded both versions. It looks interesting. I'll try and read/listen to it soon. YOU DUDES ARE THE BEST!! I'm on chapter 10. Easy to listen to. Resource film making and trying to find 100 fans. He's got some good Tony Robbins type of notions. I also like that the table read to Do Over is included in the audio. I'll listen to it and maybe I'll hear myself cough or something. I've been out of town for a few days and only just seeing this. I'll have a look. I reviewed the book. I think I did it justice with amazing brevity. Especially considering how close I was to blah-de-blah mode. Like I was going to mention my personal knowledge of his father Kevin and his ambitions with...VIDEO TOASTER. Wouldn't have done the book a bit of good but I would have been made the insider. Look up the book and check out my review. Short and sweet.